Few people in the world today keep God's Holy Days. But what significance do they have for God's Church? My wife and I attended our first service in the Church of God in August, 1951. 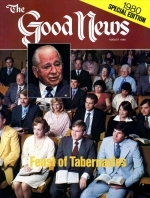 We were living near Portland, Ore., and had heard from friends that Herbert W. Armstrong would be preaching in a small house where the Church met every Saturday. Not only was this our first service in God's Church, but it was the first Sabbath we had ever observed! We had been listening since that January to Mr. Armstrong's radio broadcasts, and had been reading some of the Church's literature. It was very different from what we had been taught since childhood, but it was true according to the Bible. We had just read a booklet about the Sabbath and had accepted it, as we saw it proven from both Old and New Testament. The arguments we read against it from our own church's teachings and other religious sources did not hold up under careful biblical examination. We had been attending services with about 2,500 other people in a large Protestant church. The group we found in this "church" — actually it was a remodeled home — was only about 40 people, including our family of five. People had come from all over northern Oregon and southern Washington to hear Mr. Armstrong. What a surprising time we had that Sabbath! It was utterly unlike anything we had experienced before. We had been forewarned about what to expect, from the people who told us about the service. The sermon was the longest we had ever heard, and the subject was covered in more detail than any other subject we had ever heard expounded. That was not quite as surprising, though, as Mr. Armstrong's reference, on several occasions during the sermon, to "the Feast of Tabernacles" and "the Days of Unleavened Bread." He might just as well have been speaking in Greek or Chinese, as far as I was concerned. What strange sounding names these were! I had been a Bible student ever since I could read. I rather prided myself in reading a chapter or two of the Bible every day and had always faithfully attended Sunday School, but I never remembered reading In my Bible about such things as we heard of here. It took me a couple of months to really be convinced about these strange "Holy Days." But I had accepted them by the time the Feast of Tabernacles came that fall, and I went to Belknap Springs, Ore., where the Feast was being observed that year. As I recall, there were only 100 or so people attending. God has certainly given fantastic growth to His Church in the 29 intervening years! Probably you could tell a similar story about your introduction to God's Church, and how surprised you were when you first heard about the Holy Days. It is to be hoped that we all have been doing a lot of study since then to prove these things, and that we refresh ourselves of these same truths year by year. For some, this Fall Festival season may be the first they have ever observed, and so these truths may be entirely new. Others have kept the Feasts for years. In either case, let us look into the Scriptures to see what these days are all about. The Holy Days were commanded to the children of Israel before they left Egypt, before the old covenant was made and before the sacrificial or Mosaic laws were given. Exodus 12 gives the instructions for the Passover and Days of Unleavened Bread. These instructions were given while Israel was still in Egypt. The Feast of Trumpets was also commanded in Egypt, and this certainly implies that the other feasts were commanded there as well (Ps. 81:3-5). A reading of the law, especially Leviticus 23 and Deuteronomy 16, shows that the festivals were included in God's commandments to Israel. Of course, Israel disobeyed those commandments almost immediately after they had been given at Mt. Sinai (Ex. 20), by worshiping the golden calf (Ex. 32). Only at this point did God add a sacrificial law, to teach Israel obedience (Gal. 3:19). Thus sacrifices were offered on the Holy Days and every other day of the year. But just because sacrifices were added to those days does not mean that when the sacrifices were no longer needed that the days were done away — Christ's supreme sacrifice no more did away with the Holy Days than it did away with any of the other days of the year! In the New Testament, we read of Jesus Christ (and His parents, when He was a child) keeping the Holy Days. Throughout the book of Acts and the epistles we find the true servants of God keeping these feasts (see "Why I Keep the Feast of Tabernacles," p. 6). It is strange with all these New Testament texts about the Holy Days that most Christians, who claim to follow the New Testament, fail to see them. Bible prophecy reveals that even gentile people, in addition to all Israel, will keep these special days during the Millennium (Zech. 14:16). These days mean much to God, and He commands us to keep them holy. But why did God establish these days in the first place? There is no record that God made the festivals holy from the time of Adam, as He did the weekly Sabbath. The weekly Sabbath was made for man — all men, not just Jews or Israelites, though very few humans have kept it (see Mark 2:27). As we saw, God ordained the Holy Days while the children of Israel were still in Egypt. They were made holy at a time when Israel was becoming a nation — and they were made for Israel. These days were for God's people, His nation, His Church. It would be through that Church, during Christ's reign on earth thousands of years later, that the rest of the world through Israel and her God would learn of these important days. God established these days as national or Church "holidays" for a special reason. Other nations have had their holidays, too. They have usually been established by people in remembrance of nationally important historic or religious events. There has not been much rhyme or reason in the establishment of holidays, but such days help join people together in a common bond or interest. God's days are much different, because they have great purpose. They were not established haphazardly. They were not only to aid in bringing God's people together in a common celebration, but, more importantly, they reveal to God's people His great plan of salvation. In order to understand this plan of God, we need to briefly look at each Holy Day and its meaning. The Holy Days picture events of historic and future importance to Israel, the world and the Christian. To ancient Israel the Passover pictured, year by year, the birth of the nation and its deliverance from Egyptian slavery. It reminded Israel of when God sent a death angel to destroy all the firstborn of man and beast in the land, except for those who had the blood of the Passover lamb painted on their doorposts and lintels of their homes. The death angel did pass over those Israelites who obeyed God's instructions through Moses, His physical leader at that time. This event took place on the 14th of the first month. Only after this last plague would Egypt's pharaoh finally let Israel go. The very next day after this first Passover, on the night of the 15th of the month, Israel was finally assembled together and started out of Egypt. "They set out from Rameses in the first month, on the fifteenth day of the first month; on the day after the passover the people of Israel went out triumphantly in the sight of all the Egyptians" (Num. 33:3, RSV). They went out by night (Deut. 16:1) after having kept the Passover the previous day. The Passover reminded the Israelites that their firstborn had been spared in the land of Egypt as a result of obedience to God's commands. Starting the very next night they began to leave Egypt. But it was a long trek to the Red Sea, and the pharaoh and his army followed them there, ready to bring them back into slavery. Through a mighty miracle God parted the Red Sea and they walked through on dry ground. When the Egyptians attempted to follow they were all drowned in the sea. God had a great victory in delivering His people from slavery. That deliverance apparently took place during the last or seventh day of Unleavened Bread. As the Israelites observed these Spring Festivals, they were reminded of these remarkable deliverances of their nation by almighty God. But what do these Spring Holy Days represent to us as Christians? Paul said, "Christ our passover is sacrificed for us" (I Cor. 5:7). We no longer are to kill a lamb, roast it and eat it for our Passover on the 14th of Abib. The ancient Passover ritual, which required the life of a lamb, pictured the "Lamb of God" who would become our Passover — Jesus Christ. Christ became our Passover Lamb on the same day of the year that the Passover lamb was slain. He gave His life's blood so we might have the death angel pass over us and not take our lives. As a result, we may, after repentance, baptism and accepting Him as our personal Savior, be forgiven of our sins. So the Passover in Christianity reminds us of Christ's sacrifice so that we might be forgiven of past sins and reconciled to God. The next day after the Passover, the seven Days of Unleavened Bread begin. We are commanded to put leaven out of our homes for the duration of these days. This teaches us obedience and reminds us that we are to put sin out of our lives. Leaven is not sin, but it does represent sin as a type. Leaven puffs up, just as sin puffs up. Paul said, "Therefore let us keep the feast, not with old leaven, neither with the leaven of malice and wickedness; but with the unleavened bread of sincerity and truth" (verse 8). About seven weeks after leaving Egypt, upon their arrival at Mt. Sinai, God Himself spoke the Ten Commandments for all Israel to hear. He also wrote them with His fingers on two tables of stone. Historically, the Jews have said that this occurred on the next Feast — Pentecost. Now Israel had a special historical reminder as they observed Pentecost year by year. On that day, years before, God Himself had spoken His great law for all Israel to hear. But very soon after this great occasion, even after promising to do otherwise, Israel sinned grievously in making and worshiping the golden calf. A short time later they again rebelled and believed the negative report of 10 of the spies sent in to look over the promised land. God then sentenced them to spend 40 years in the wilderness, a day for a year (Num. 14:34). Pentecost also has great significance for Christians. After we repent, are baptized and begin to put sin out of our lives, we find that another ingredient is necessary — God's Holy Spirit. It is a power emanating from God, a portion of His very own character. It begets us to eternal life. It was on Pentecost in A.D. 31 that God sent the Holy Spirit to beget, inspire and strengthen His servants. Pentecost is a Greek word and is commonly used in the New Testament for this third Festival of God. But this Festival was called by other names such as the "Feast of Weeks," because it was necessary to count seven weeks from Sunday during the Days of Unleavened Bread to determine when it would be observed. It was also called the "feast of the harvest, the firstfruits of your labors," because it was connected with an important harvest. Actually it was the early harvest in Palestine, starting during the Days of Unleavened Bread. This was a much smaller harvest than the fall harvest and included primarily grains. A much larger harvest ended just before the Feast of Tabernacles. This smaller harvest, or harvest of "firstfruits," reminds us that the spiritual harvest God is reaping now is the smaller harvest. The much larger spiritual harvest will come later, when God will save the world. Because of Israel's grievous sins, God denied them the opportunity to enter into rest in the land of Canaan at that time instead of having to wait several thousand more years. "For if Joshua had given them rest, God would not speak later of another day" (Heb. 4:8, RSV). If Israel had entered that rest as a result of obedience, they would have understood the special national meaning in celebrating the great Fall Festivals. But they probably had little, if any, perception of the relationship between these days and God's overall plan, or what they would later mean to Christians. The next festival is the Feast of Trumpets. It might literally be called the Day of Blowing (Num. 29:1), from the. Hebrew yom turuah. This day was marked by a blowing of horns or "trumpets." The book of Revelation and certain prophecies of the Old Testament speak of trumpet blasts in a prophetic sense. Revelation's seven last trumpets signal dire plagues that come on the earth as a result of God's intervention in the affairs of this world. These events climax with the return of Jesus Christ and the resurrection of the saints at the seventh or last trumpet. This is followed by the establishment of the Kingdom of God on earth. The next event in God's plan is pictured by the next Holy Day, the Day of Atonement. Celebrated on the 10th day of the seventh month, it is a day of commanded fasting, or total abstinence from food and drink. The ancient ritual for this day is found in Leviticus 16, where the removal of the Azazel goat represents the banishment of Satan into the "wilderness" where he will bear all the iniquities he has caused in the world. This symbolism is described in plain language in Revelation 20:1-3. Here Satan, who has deceived the whole world and accused the brethren (Rev. 12:10,20:3), is bound in an abyss for 1,000 years and his evil activities are brought to a halt. With Christ ruling on earth, assisted by the now-immortal saints, we come to the events pictured by the Feast of Tabernacles and the Last Great Day of the Feast. Now Christ, ruling in His Kingdom, finally begins the work of saving the whole world. Paul refers to an important part of this process when he says, "And so all Israel shall be saved" (Rom. 11:26). This is one of the most exciting and significant verses in the Bible, since Isaiah and other prophets show that the gentiles will be called, too! God is no respecter of persons, as far as salvation is concerned. The first seven days of the Feast of Tabernacles picture the millennial period. This is 1,000 years when the whole earth will be full of the knowledge of God. But one great day still remains — the Last Great Day or eighth day of the Feast. There is still an important work to be done. All the dead who never knew the real Jesus Christ and who never had a chance to be converted — the ones God the Father did not draw to Christ before — are still in their graves, dead. These vast multitudes will be resurrected to physical life. The books (of the Bible) will be opened to their understanding for the first time (Rev. 20:11-12). The book of life finally will be open to them. If they live according to the books (Bible), repent, obey God and overcome, they too will receive eternal life. The incorrigibly wicked will then be cast into the lake of fire, also called Gehenna fire (verse 15). The earth, purified by this fire, will now be ready to be made new, "And I saw a new heaven and a new earth: for the first heaven and the first earth were passed away; and there was no more sea" (Rev. 21:1). That is a skeletal outline of God's plan of salvation as portrayed by the Holy Days. There is much more that cannot be told here in these pages. Come to the Feast of Tabernacles and hear the rest of the story!